ANTOP UFO 720°Dual-Omni-Directional Outdoor HDTV Antenna Exclusive Smartpass Amplifier &4G LTE Filter, Enhanced VHF/UHF Reception, Fit Outdoor/RV/Attic Use(33ft Coaxial Cable, 4K UHD Ready). Color: Dual Omi UFO Antenna Brand: ANTOP. Product Dimensions: 15 x 15 x 10.3 inches. Item Weight: 5.22 pounds. 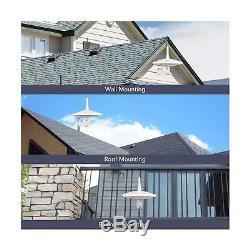 Perfect for outdoor, attic, RV and marine used. AESTHETICALLY CLEAN DESIGN - Creative design in light weight aimed for simple DIY and SIMPLE SET-UP in 5 minutes. Tools-free and easy installation with minimum effort. SHIELDS AGAINST INTERFERENCE - Build in 4G LTE Filter shields against interference and blocks unwanted 3G and 4G wireless signals for stable performance. 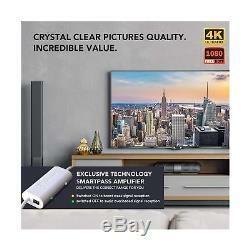 Enjoy smooth and crystal clear 4K HDTV experience. DELIVERS THE CORRECT RANGE - ANTOP Exclusive Smartpass technology Amplifier allow easier adjust the balance between short and long range reception , and the intelligent switch can avoid signal overload. DURABLE EXTERIOR&WEATHER RESISTANT - UV coated, weather resistant exterior design combined with anti-interference internal tech, protects signal reception to provide clear pictures and full channel capacity even during inclement weather. 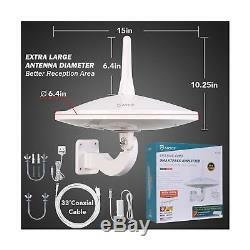 Color:Dual Omi UFO Antenna Antop Dual Omni-directional Antenna- No monthly bill for watching TV! 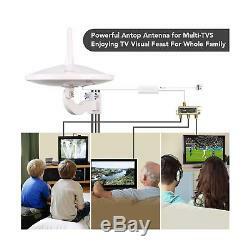 The ANTOP UFO AT-415B, a Dual-Omni directional TV antenna provides Complete Coverage reception: 360° horizontal, 360° vertical. Designed for home and RV use. ANTOPs exclusive Smartpass Technology amplifies signal range up to 65 miles from broadcast origination source! Assuring you more channel reception and less blind spots. ANTOPs New Generation Digital Technology 1 Dual Omni-directional Complete Coverage Reception Pattern: 360°horizontal, 360°vertical. 2 Smartpass Amplifier, exclusive ANTOP technology, uses an all-in-one design allowing easier connection while delivering the correct balance between short and long range reception. 3 4G LTE Filter: built into all ANTOP amplified TV antennas, blocks 3G and 4G wireless signals for noise-free digital reception. 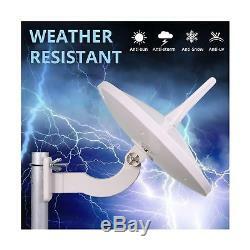 4 High Gain reception technology, shielded for minimum interference. 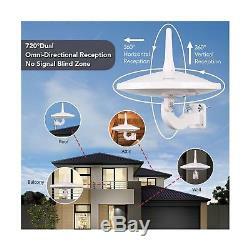 Product Information/Features Range: 65 miles from point of signal origination Power Supply: DC 12V Reception Pattern: Dual Omni-directional Polarization: Horizontal/Vertical Color: White Size: Ø15.00in Whats in the box AT-415B UFO Dual-Omni Smartpass Amplified Outdoor HDTV Antenna AC/DC Power Adapter Power Inserter with Smart Switch Outdoor Bracket Mast Clamp Kit (2 pcs) Vertical Antenna Rod 33 Coaxial Cable Screw and Anchor Kit (2 pcs) Instruction/User Manual. We stand behind our products. Your receive the wrong item. 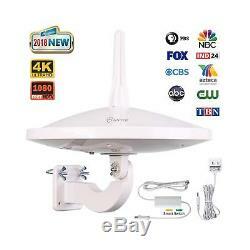 The item "ANTOP UFO 720°Dual-Omni-Directional Outdoor HDTV Antenna Exclusive Smartpass" is in sale since Monday, October 29, 2018. This item is in the category "Consumer Electronics\TV, Video & Home Audio\TV, Video & Audio Accessories\TV & Video Accessories\Satellite Dishes". The seller is "everydayideas" and is located in US.